A quarter of the year has passed since I last wrote about SGD INR and it is satisfying to see the analysis going right – the pair dropped below 32 in the first quarter. I did not realise that I happened to be one of the few who write about the pair and recently a lot of people have been asking my views on the pair given the new financial turmoil stirring up on the horizon. Before going into details lets enumerate the factor variables and conflicting forces active at this point in time. The Euro precipitation due to crisis in Greece. Recovery in US economy and its impact on USD. Add to it that SGD INR is a cross pair determined by movements of SGD/USD and USD/INR. USD/INR dropped below the mark of 44 a few days back and has since sharply recovered. The long term mean for the pair has been the 44-45 mark with fluctuations of Rs.5 either side. The pair would continue to strengthen as the Indian economy grow and there is Foreign Direct Investment. With the greece crisis stirring up there is bound to be some profit taking in the Indian markets by FII and flight of capital outside India. This would result the pair moving towards the 46.0 mark as a knee jerk reaction. Further more with EUR depreciating the USD – there will be added strength to USD which would indirectly work in favour of USD/INR marching upwards. However with Yuan appreciating against the USD some of the USD strength against all currencies would be negated. This one is a more complicated pair to analyse. The singapore economy has shown good growth in the first quarter and the pair has gradually strengthened to below 1.40 levels. The MAS has shown intent to let the SGD appreciate against a basket of currencies. No one knows for sure what is the composition of this basket – but USD and EUR definetely are larger components. There is a posibility that Yuan might be added to this basket if not already a part of it or get a bigger weightage if its already there. With currency appreciation a way to reign in inflation the pair might edge back to 1.35 though this movement would be gradual. On the flip side a strong currency makes exports cheaper for Singapore – both services and manufacturing and government might still want it to hover around sub 1.39 mark. How the 2 impact SGD/INR? I would recommend this retracement to convert SGD to INR before the long term trend of a march towards 30 resumes. 2009 proved to be a volatile year for a lot of currencies – specially the pairs with USD as one of the component, but the cross currency rates like SGD/INR showed relative stability. The pair has moved between 32 and 33.5 over the past 2 years. The question a lot of you would be asking is what happens in 2010? So here is my analysis. I expect SGD/INR to turn towards 32 to 30 range over the next 6 months to a year. 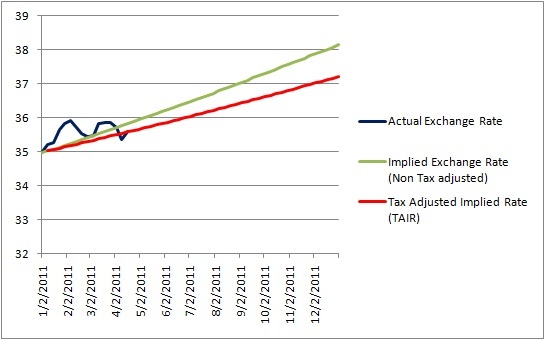 A look at the chart below would show that the pair failed to stay past 34 mark even though it crossed it once. The pair has been hovering betwen the 33 – 33.5 mark for past 6 months. The Singapore Monetary authority has been maintaining a policy of gradual appreciation of SGD against the USD. This has been giving SGD strength against the INR as well (SGD/INR) being a cross rate. The latest economic data shows that the Singapore GDP shrank by 6.8% in Q42009. This would force the MAS to rethink about the strong SGD approach. The most likely scenario is for SGD to move to the 1.45 – 1.50 range against the USD. 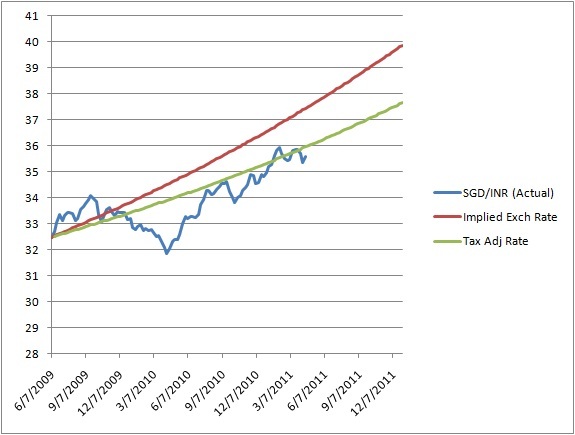 traditionaly the MAS has allowed SGD to strenthen against basket of currencies with growth in SGD. Indian economy on the other hand has been performing well and the projected growth in GDP is 6.5 to 7.5%. With improving GDP numbers and growth in economy the INR should strenthen back to its long term mean of 44 – 45 against the dollar. Using these two assumptions we can plot the projected move of INR against SGD. 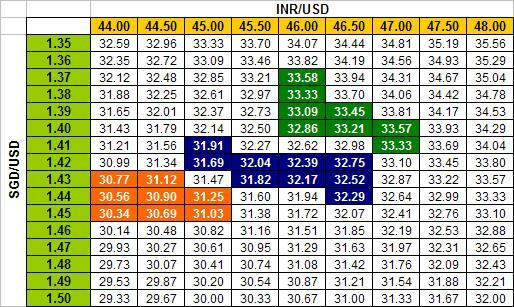 The cells in dark green indicate the current range of SGD-INR depending on the rates of SGD and INR against the USD. The cell is amber indicate the longish term range as the growth gathers steam over next 1 year. So as always – I would recommend converting converting SGD to INR at any rate above Rs.33 for a Singapore dollar. At the time of writting USD/JPY is trading at 88.06 after having tested 86 in the past few days. There is a general concern of yen stregnthening further but I would place my bets other way round. My recommendation is to but USD/JPY in two tranches. first one now at 88 and again if it drops around 86. There should be a quick bounce back to 90 giving around a 3 – 5 % gain. Over the next 3 months USD/JPY should make a move towards 93-95 range. The USD JPY chart below shows that the pair is trading near its 2 years lows. From a pure technical perspective this is a reason good enough to initiate long position. From the fundamental perspective the risk of inflation has started to look very real in next few months. The central banks would have to increase interest rates in the coming months. The trend has already staretd in the Asian economies. With Fed tightening the interest rates the carry trade between USD and JPY will be back in vogue. One can argue that Japan can increase the interest rates as well – but seeing the latest GDP and export numbers, Japan has every incentive for a weaker currency. It is very difficult to say if the pair would return back to the 120 – 123 mark in near future but a good 10% upside from the current levels of 88 is what I am expecting. The USD/JPY achieved the first target of 90.00. People can hold position for the longer term. Over the next 6 months period it would not be surprising to see USD/JPY flirt with the 98 – 101 levels. SGD/INR whats happening with it? Its been time since the last post on SGD/INR and a lot has happened in the currency market. Though surprisingly the SGD/INR rate has moved in the narrow range of 32.5 – 33.50. The past few months saw SGD strenthening from 1.55 to 1.44 against the US dollar. Rupee on the other hand moved from 52.5 to 48.00 against the greenback. In the light of the new data converting singapore dollars to Indian Rupees still makes sense. Even if the Singapore dollar stays at 32.75 agaist the Rupee the gain turns out to the 5.6% and a chance of loss is only if the Rupee weakens beyond 34.60 against the SGD. As earlier thats a unlikely scenario. The probability of Rupee strenthening against the USD to the range of 44 – 46 is extremely likely and that would see SGD INR heading down to Rs.30 levels. When will that happen is really difficult to say, but for the time being it still makes a lot of sense to convert SGD to INR (those of you who followed the post in the past must already be sitting on annualilsed gains of 5.6%). If you want to go a step further then borrow in Singapore dollars – a lot of banks are running offers for 6 month loans for a effective rate of 3% p.a – and convert to INR. Even with the interest lay out you stand to make near riskless gains of upto 3% or more! !